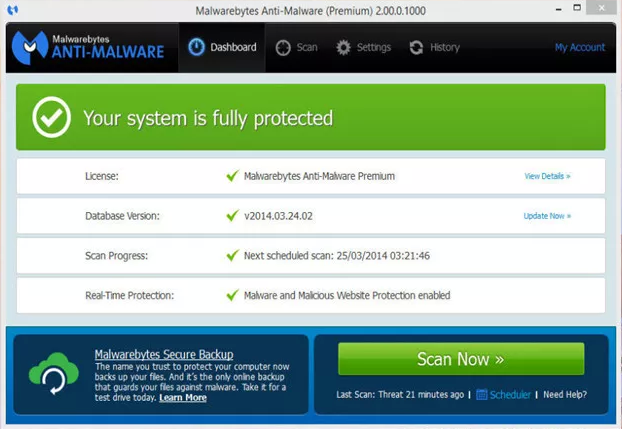 We recommend Malwarebytes Anti-Malware to remove malware infections. Malwarebytes is always updating their database in order to continue improving the application's amazing malware detection and removal tactics that make it so successful. Malwarebytes Anti-Malware can detect and remove malware that even the most well known anti-virus and anti-malware applications fail to detect. If you are still in need of malware removal assistance, please follow the links above in the navigation bar so we can further assist you. In order for us to best assist you in removing your malware infection, you must, register on the forums (it's completely free as is the support), post an OTListIt2 Log in the BestTechie Malware Removal Forum and then wait for assistance. Please do not double post on the forum. We will assist you as fast as possible. This typically means you will receive a response within 24 to 48 hours. However, if you do not receive a response within 48 hours, feel free to post in this thread. This site is an affiliate site of BestTechie. It is owned and operated by BestTechie Holdings, Inc. If you have any questions and/or comments (not malware related) feel free to email us using the contact form on our website. Copyright © 2015 BestTechie Holdings, Inc.